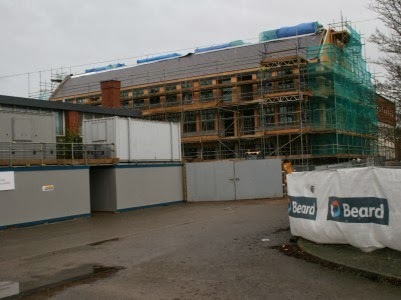 The new Science Centre at St Helen and St Katharine is progressing well. 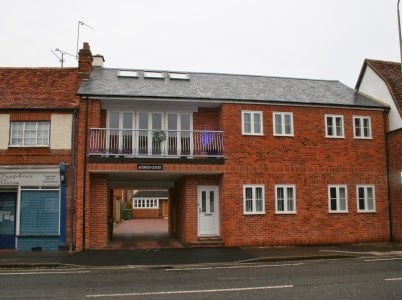 New flats have been built on Marcham Road. Audrey’s Flower Shop was once on this site on Ock Street, but now it is Audrey’s Court. 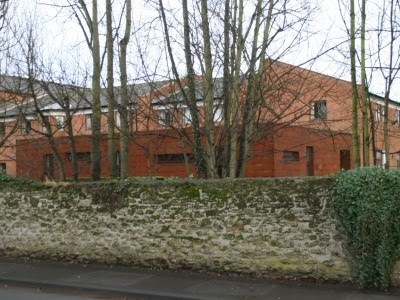 A new Design and Technology Centre opened at Our Lady’s Abingdon in October. 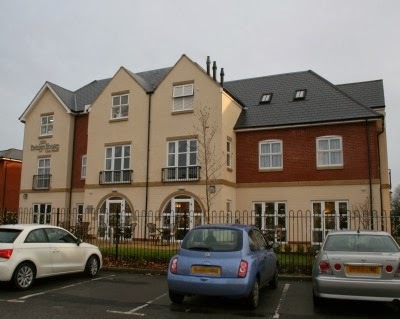 Bridge House, a Care Home between Waitrose and the Abbey Gardens, also opened earlier in the year. 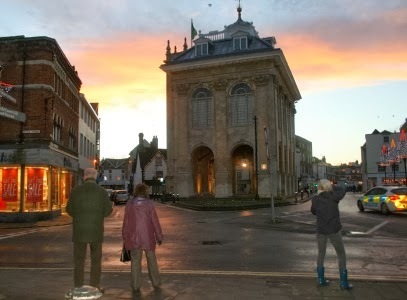 This was once the site of the Abbey Press. 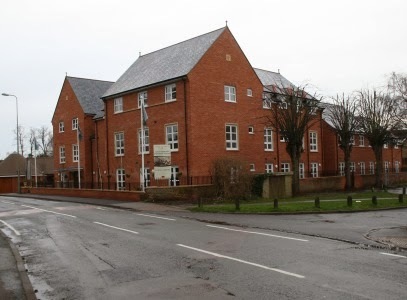 Campion House, next to John Mason School, was demolished, and replaced with Retirement Apartments in 2013. 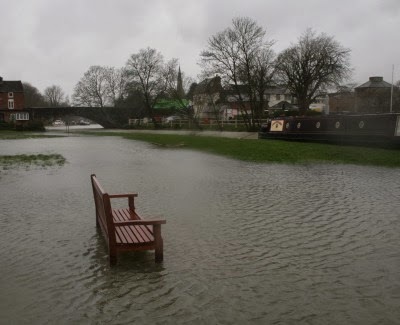 A busy town on one bank; cattle, knee-deep in water by the other! 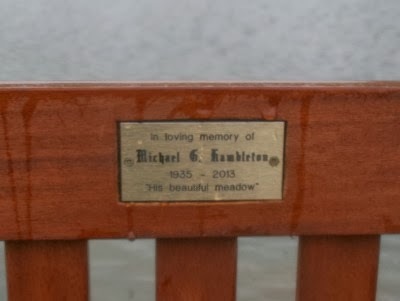 The floodplain over the other side of the River Thames is still under a lot of water, as is the seat in memory of Michael Hambleton (Minister of Abingdon Baptist Church 1991 to 2000). It was raining again this morning and most of my pictures got blurred and are unusable. 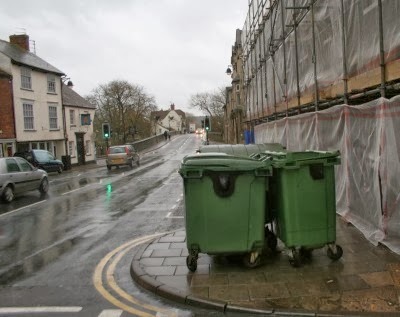 At the end of 2013, there appears to have been no progress in finding a solution to the bins at the bottom of Bridge Street. At one time they were hidden away behind the Old Police Station, but once development started they lost their home, and have been in full view for about three years. 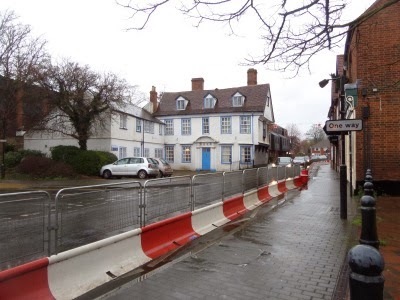 The barriers at the upper end of Stert Street have been there for two years now. Some partial work was done on stabilising the underground River Stert in 2012, at the lower end, but there has been no further progress since, and so that bus stop is still not in use. 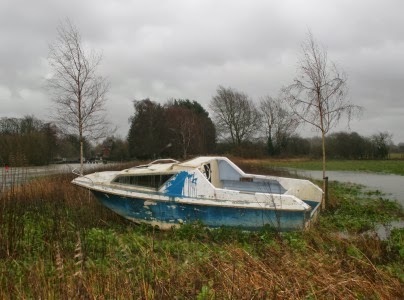 A boat has been in a field next to the River Thames for about a year – since it got beached in last winter’s floods. They may not be high priorities but they are all very noticeable. Press on Changes in 2013 for a bigger pdf version. Not a brilliant map and not to scale but it serves this yearly purpose. Green is a shop that was vacant at the start of the year which is now occupied. Yellow means a change of ownership. Red is a vacant shop premises that was occupied at the start of the year. The Narrows (Wetherspoons) opened on the High Street in the Old Post Office. QC closed. Art and Stuff is now where Skinny Hippo was. The Olives has replaced Kitsons. New Look moved and took one of the new larger units down Bury Street. Costa expanded by knocking through into the empty Jessops premises. Hatton Goldsmiths downsized and took one of the Bury Street kiosks. Phone Box took the other kiosk. Philosphy moved to the Market Place, and was replaced by Simon’s News who had vacated ER Goffs, now undergoing a refurbishment. Salinas came back – more as a Coffee / Snack place than the restaurant it had been before. Belinda’s Jewellery Box opened where there had not been shop recently on East St Helen Street. Sean Antony should follow soon. On West St Helen Street it was goodbye to Faulkner Photography and Paul Viney Photography who continue to operate but without a town centre studio. 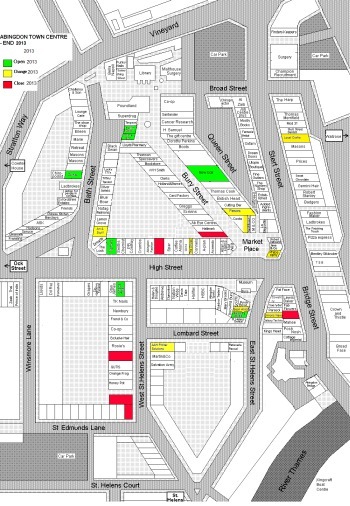 Withy King (moved to Vineyard Chambers), Lansborough Estate (moved to Ock Street), and Natural Health (moved to Coxeter House). 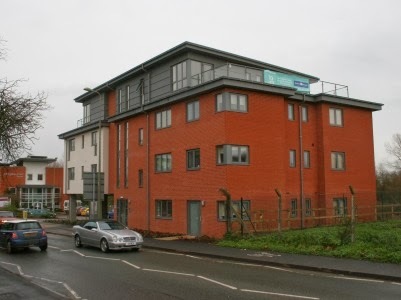 AAH Printer Solutions moved from Coxeter House. Chaba Thai moved in where The Thai Orchid used to be. Only Spar was open on Christmas day and they did a good trade, but quite a few shops had re-opened on Boxing Day. 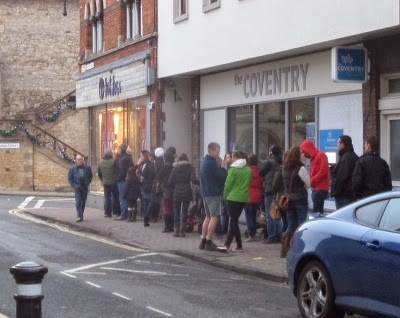 Bargain hunters were queuing outside fat face when the shop opened at 10am on Boxing Day.